The word ‘tree hero’ is an umbrella term used by Just Trees for people who go above and beyond to save various tree species on earth. From people who start tree planting campaigns like Felix Finkbeiner, or are active participants in environmental activism and restoration projects like Dr. Wangari Muta Maathai, Kenyan Nobel Peace Prize winner and founder of the Green Belt Movement, to everyday heroes like nursery managers on tree farms. These are all people who celebrate the wonder of trees and those we consider to be heroes for it. 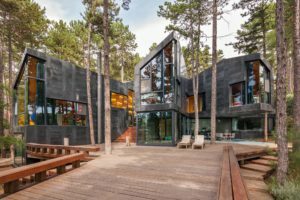 In this post, we’ll be looking at various architects whose consideration and appreciation of trees lands them in this category. These are the people behind the designs of homes that have embraced the nature they’re surrounded by. The results are truly magnificent and beautifully executed. It’s a movement that will hopefully inspire many more architects in the future! First, on our list, we have the extraordinary Casa Levene, one of the most famous Spanish design houses of the past decade. This project is a custom design of the architect Eduardo Arroyo from the NO MAD Studio in Madrid. Casa Levene is a 4 bedroom home weaved amongst the trees in the forest per Robert Levene’s request. In order for this house to fit into the chosen area, it had to take on an extreme design as well as careful planning to ensure that the house wouldn’t have an impact on the surrounding trees. An interesting fact about Casa Levene is that it is built on ‘steel fingers’ that were distributed between the tree roots in the ground beneath it to preserve the spectacular surrounding forest. 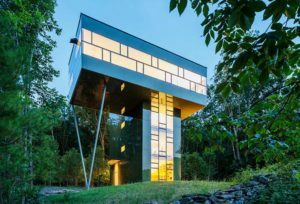 In a similar attempt to incorporate the elements of nature with a home design, Peter L. Gluck took a different approach to preserve the surrounding forest. 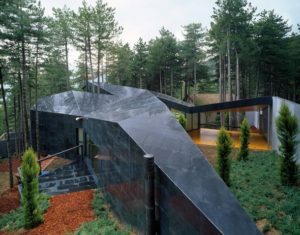 The design of the Tower House was heavily influenced by the fact that they wanted to create an almost invisible home that took up as little space on the ground as possible to limit the impact that the structure would have on the environment. The reflective surface combined with the design that made it possible for the living area to be situated at the top rather than the bottom not only ticked off all the design goals but it also gave the home an incredible view of the greenery that it’s surrounded by. 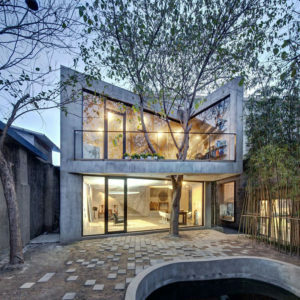 The Tea House is located in the backyard of Archi-Union’s J-office in Shanghai. In contrast to the previous two home designs, this project is located in an urban environment where an existing tree had sprouted from the ground before the structure was built. Instead of removing the tree the architects created a triangular balcony to incorporate the tree into the design in order to make the most of their constricted building space. The result is a beautiful space with a view from the library that is situated on the top floor of the building. The beautiful mango tree called “Bethany” is probably the most spectacular centrepiece that a home has ever had. Architect Alessandro Sartore is behind the design of this home located in Rio de Janeiro, Brazil. In order for this design to feature this lovely piece of nature in its interior, however, a ten-foot hole had to be made in the floor as well as the ceiling of the living room. Not only does this design dazzle us with its beauty, but it also incorporates elements of #treeification. The placement of the tree allows natural light to filter through and proper ventilation into the living area. 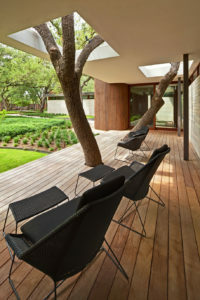 The architects had to forgo air conditioning to accommodate Bethany as well as another tree that is located in the garage, but the shade provided by the mango tree along with the glass walls keep the house cool even on the hottest summer days. 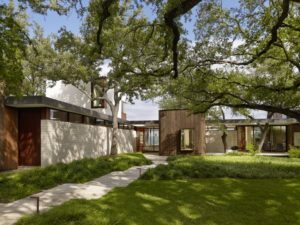 In Austin Texas the Lakeview Residence designed by the Alterstudio Architecture team was inspired by a family of four’s desire to live among a collection of mature live oak trees. The new home is a wonderful combination of nature and cozy living. The tree on the front porch was brought into the design by creating perfect round circles in the wooden platform to allow the stumps to poke through while the ceiling had squares cut out to accommodate the branches. These five stunning designs make it clear that incorporating nature in our living areas can prove to be aesthetically pleasing while at the same time adding a unique quality to homes. For instance, ‘Bethany’ eliminated the need for air conditioning or curtains in the living area it was placed which allows natural sunlight to warm up the living space. These architects’ ability to think creatively about their designs in order to obtain harmonious environments definitely earns them their spot in our tree hero archive! We’re incredibly excited to see the designs that lie ahead and hope to see this approach to architecture becoming more common in future projects!